Play Belote online for free now! The cult card game Belote from France has been thrilling players around the world for more than 100 years! So what makes Belote so special? Not only is it great fun to play, but thanks to its unique gameplay there’s no shortage of excitement to be had. Jack, Queen, King or Ace – what will be your winning trump? 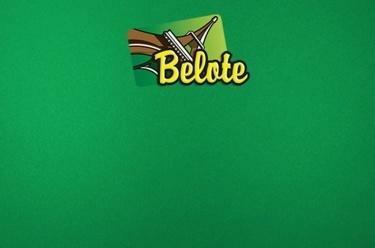 Enjoy the French card game Belote online on GameTwist. Play a version in which you can have a great time playing, from the first trick through to the very last! Here you can find out more about Belote to become a better player and, with a little luck, win more! Belote is a popular French card game for four players who play in two teams. It is a close relative of Clobyosh, which is played in Jewish communities all over the world, and the Dutch game Klaverjassen. The aim of the game is to collect as many points as possible with your partner by taking tricks and making announcements (depending on the variant you play). The team that reaches the agreed points limit first wins the game. You can choose between classic Belote (with or without announcements) and Belote Contrée. If you hold the trump Queen and the trump King (Belote and Rebelote), you receive additional points. Take as many tricks as possible and score the most points with your partner! Belote on GameTwist: Experience this extraordinary game online – often free of charge! There are so many reasons why Belote on GameTwist delivers such a special gaming experience with every card that’s played. … players around the globe register on GameTwist just to be able to play Belote? ... the multiplayer mode enables you to play simple but thrilling card games around the clock? ... you can set up your own gaming table or join one set up by another player? When you set up your own game, you have a few decisions to make. Can anyone join you at your table or only friends? 2. What are the stakes? And 3. Do you want to play with announcements, without announcements or Belote Contrée (all cards are dealt)? ... Belote online is available on your computer, mobile (Android and iPhone) and tablet? The user interface specially designed for mobile devices ensures that you can enjoy thrilling games wherever you are! In France – the motherland of card games – Belote ranks up there with Tarot as one of the best games ever. And it’s a huge hit online too! One of the reasons it is so popular is that it’s the perfect game for playing with friends and family, without the need for big money stakes. Nevertheless, there are professional Belote tournaments in which the best of the best battle it out for impressive prizes and even money! Because Belote has such a vast following, we pulled out all the stops to develop a game that is guaranteed to keep our community entertained. And we’re confident we got it right, for there’s always plenty going on in the game lobby. The most important rule in Belote is that experience tumps everything! If you are trying out the popular card game on GameTwist for the first time and you’re not entirely sure how it’s played, don’t just throw in the towel! Click on “Details” in the menu to find the rules of Belote. Reading through our guide will help you find your feet. Plus, you can search online to find out even more about this card game. It’s also worth noting that you’ll get better at Belote with every card you play. So, be patient and improve your skills step by step – you’ll be showing your opponents how it’s really done in no time. We’ll keep our fingers crossed for you. Your first trick is just a few clicks away! By the way, on GameTwist you’ll find a host of further hit card games – including Solitaire, Spider Solitaire, Rummy and Poker – and a wide variety of fun board games!